Margo left a comment recently asking me how I bought fabric. I thought replying just "Like a drunken sailor on shore leave, if drunken sailors bought fabric" probably wasn't helpful, so I thought I would lay out some rules for buying fabric that have served me well over the last few decades. 1. You never have enough fabric. If you tell yourself "I have enough fabric," you jinx yourself and will immediately need more fabric (except now that you've angered the fabric gods, everything will be horribly polyester and $15/yard). You ALWAYS need more fabric. 2. If offered an opportunity to shop for fabric, take it. You never know when you're going to need more fabric (oh, wait — yes you do know, and the answer is "all the time" — remember rule one: "You always need more fabric"?). So take advantage of every opportunity to shop for fabric. 3. If it is $1/yard and not aggressively hideous, buy three yards. If it's $1/yard and acceptable, buy five yards. If it's $1/yard and, if the fabric were a man [or woman] you would agree to meet him [or her] for coffee (but not a dinner date) buy ten yards. Any liking over that requires a fifteen- to twenty-yard purchase. 4. 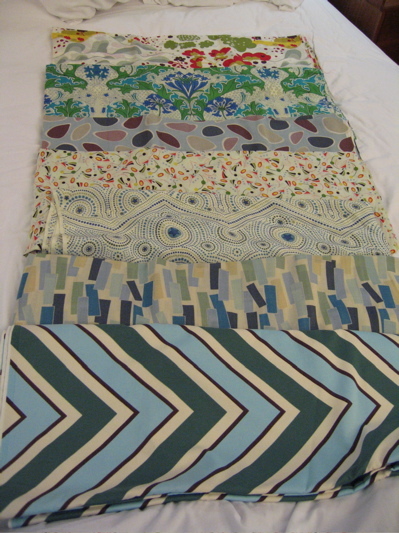 The basic unit of fabric purchase is four yards of 45" or three of 60" wide. Any less than that and you won't be able to get a fullish skirt out of it. If it has a large repeat (the amount of space it takes to repeat the pattern) or is a border print, or has stripes, or really, anything out of the ordinary, buy five yards. Don't bother carrying yardage for specific patterns with you: if you do buy exactly enough for a particular pattern, you will then cut out one piece wrong and when you go back out to buy more it will be all gone. 7. The proper ratio of prints to solids in your fabric purchasing is 10:1. The rationale for this is that good prints are fleeting but solids are always available. In fact, you should never actually have any black fabric in your stash. That is because keeping black fabric in your stash means you won't have a reason to go to the fabric store when you need black fabric, which would contravene rule 2. 8. If you make theatrical costumes, or participate in historical reenactments, or have ever thought "Someday I am going to make the Kinsale Cloak" you may only buy velvet in 20-yard increments. 9. Always make time to buy fabric when traveling. Global Economy, Schmobal Economy. They got different stuff there, wherever "there" is. Pack an extra bag, if you have to. 10. If you think, while looking at fabric, "I'd have no place to wear this, even IF I made it into anything," close your eyes and envision yourself in tears of rage and disappointment, having been invited at the last minute [but with enough time to sew something] to JUST the perfect place to wear something made of that fabric. The most horrible thing in the world is regret: protect yourself from it by buying fabric. And besides, how dumb will you feel when you're freezing to death in the coming nuclear winter/ecological catastrophe, if you don't buy five yards of that wool now? 11. Fabric bought online doesn't "count" against any self-imposed quotas (quotas which violate rules 1 and 2 anyway). Fabric purchased on eBay DOUBLE doesn't count. Know to the minute how long it takes you to get to each fabric store in your area. This will allow you to plan quick anonymous stops between other errands. It is better to go to the fabric store without a particular fabric in mind. When the buyer is ready, the true fabric will appear. So Margo, I hope this helps you, but I'm afraid I cannot be held liable for the size of the stash that will come from following any of these rules. Obey at your own risk. When someone pays me an unexpected compliment, I ofetn tell them that they made my day! Found this in 2014 but still wonderful. I sent it to my husband so he’d better understand me. The rules, of course, are all true.